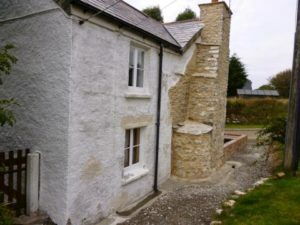 I’ve done quite a lot of work on this holiday cottage in North Cornwall, this summer past it was the turn for the exterior masonry. 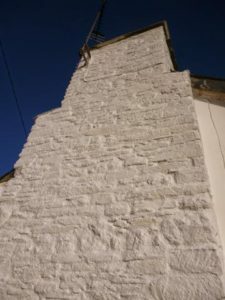 The stone chimney and construction for the Clome Oven had been re-pointed with Lime mortar earlier in the year, which had now cured long enough to allow painting. 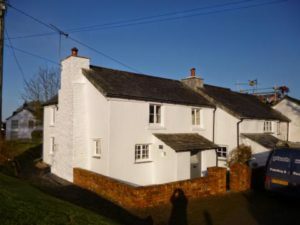 Other parts of the property had been painted in the past with standard masonry paint which was peeling badly at the front of the cottage. Closer inspection showed the peeling masonry paint had been wrongly painted over a Limewash underneath, previously applied when the front of the cottage was rendered many years ago. As expected, once the pressure-washer got to work, all the masonry paint lifted off. There is a small gable wall around the back which was bare slate masonry, as well as some unpainted cement masonry. and a section of bare slate stone wall. ……….oh, and lots of damp corners where green algae loves to grow. Different substrates. 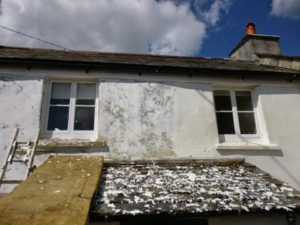 One solution would be to use a limewash on the lime and masonry paint on the cement render. 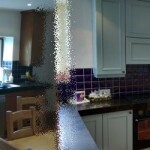 But then that would mean different shades of white, and different re-painting cycles – not very good. Another alternative could be to soak the lime surfaces with stabilising solution, and then paint standard masonry paint. Cheap and cheerful, but not very breathable. 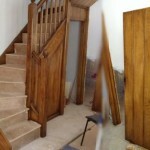 My local supplier – Tecbuild in Bodmin – reckoned they had the answer. Mapei are an Italian firm better known in this country for floor and wall tile adhesives, but they do lots of other products and are importing a Silicone resin paint called Silancolor Paint Plus. It’s highly mould and fungal resistant, very vapour permeable while shedding rain, and breathable, as well as paintable over many different substrates. Coming as a complete system comprising a surface anti-fungal cleaner, a watery primer, and then the paint, I won’t pretend it’s the cheap option. Rather than cheap-as-chips masonry paint, you gotta think more in the line of specialist high quality coatings like Keim etc. 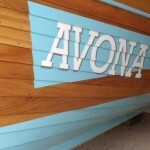 However, it seems to tick all the boxes, and painted and covered like a “normal” paint.